Fr. 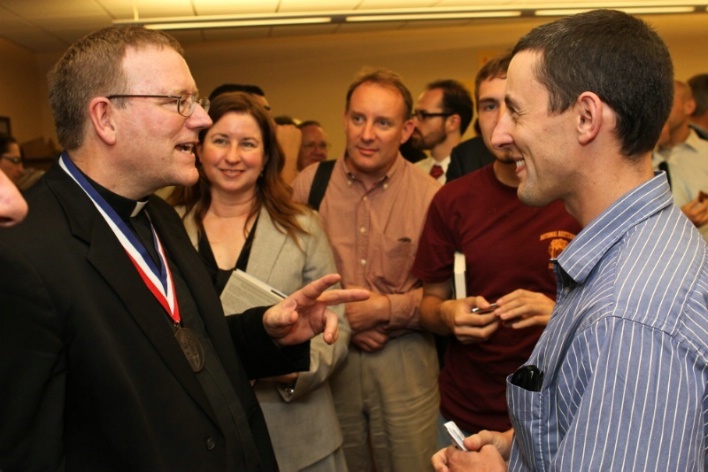 Robert Barron, who gave the Fall Lecture entitled, "Culture Cries Out for Christ", speaks to members at a reception after the event. The John Carroll Society welcomes new members. Applicants for membership in the John Carroll Society must be sponsored* by at least one active member of the Society. You may register online by completing an application at the "Join JCS" link on this page. Please complete the application and then fill in your sponsors name on the bottom portion of the application. The Society’s annual dues are $85; spousal membership dues are $140. Spouses must complete a separate application. A member may also contribute as one of the Society's special supporters: Benefactor ($1,750), Sustainer ($1,250), Fellow ($600), Sponsor ($350), and Patron ($250). Benefactor and a guest may attend the Red & Rose Mass Brunches, the January Brunch and the Annual Dinner free of charge. Sustainer may attend the Red & Rose Mass Brunches and the January Brunch free of charge. Please allow two to three weeks for email notification from the Society about your membership acceptance. Thank you. *If you do not know an active member of the Society and would like to inquire about membership, please contact the Society office at 301-654-4399 or johncarrollsociety1951@gmail.com.